When Cristin Of Cristin's Cookies announced that she was hosting a "Hello Kitty Cookie Challenge", I thought it would be a good time to use my new Hello Kitty cookie cutter. 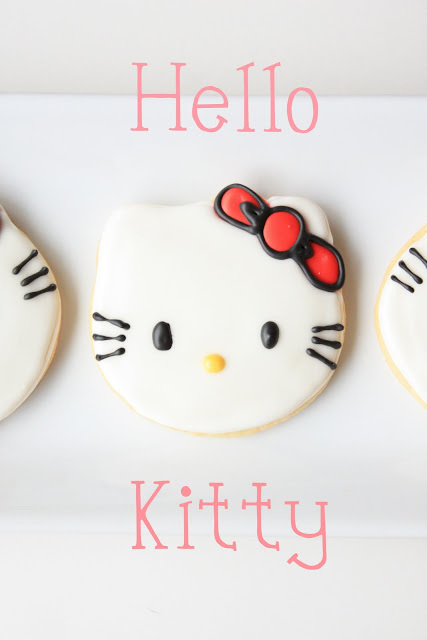 (Click on the link for some cute Hello Kitty cookies.) Thanks for the challenge, Cristin! It was a lot of fun! It also gave me the perfect chance to make another cookie on a stick~which I have a fondness for:) This cookie has been up my sleeve for awhile. I had a much harder time with the bow on this cookie, but the technique from Sugarbelle(and her picture-perfect Hello Kitty cookie) sure helped out! Thanks, Callye! These cookies are sugar cookies with royal icing. For the bow, I found an image of Hello Kitty on the internet and enlarged it to use as a template. I traced it onto a file folder, cut it out, placed the template on the cookie dough and cut around it with a small paring knife. I inserted the cookie sticks into the cookies after they were placed on the baking sheet. Oh my goodness, my daughter would LOVE these. I wish I had one! I love HK sooo much... my friends/family are constantly loading me up with Kitty loot for birthdays and Christmas. Love it, Sue. As usual a home run! You are so awesome. I am impressed that you just made a template and created those cookies. They are great! Love this new baking challenge and adore your cookies. My daughter would absolutely love these!!! Great Job!!! Really cute! Another flashback to my oldest daughter! It would be fun for her 30th birthday this year to make some of these fun treats that were icons when she was little. Cute! I love your Hello Kitty cookies! So cute, especially love the bow! They look just like Hello Kitty! Great job making them. 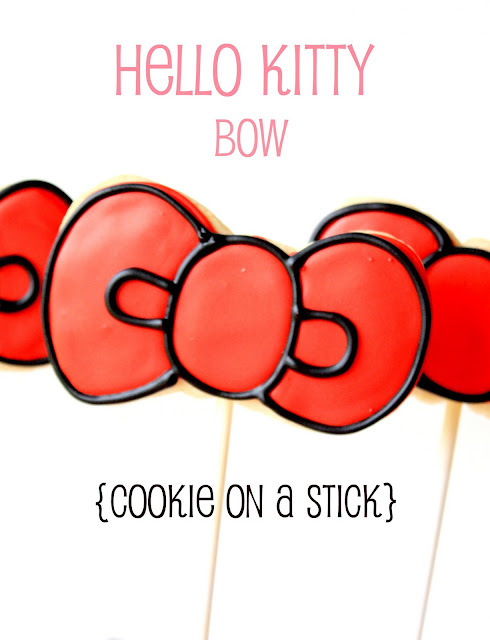 love the bow cookie! just perfect!! Did you use a bowtie cookie cutter for that? Its my daughter's b-day and just wanted to know! thanks! You are truly talented! Antoinette, The last paragraph of the post answers your question. No cookie cutter used:) Have fun!